Hello everyone, this is PJ Thum. One year ago on 29 March 2018, I went before the Singapore Parliamentary Select Committee for Deliberate Online Falsehoods, or “fake news”, to use the common shorthand. To my surprise, instead of speaking about my submission to the Committee, I was ambushed with a six hour interrogation about a paper I published in 2013—or, to be more precise, about one paragraph in that paper, about Operation Coldstore, the 1963 arrest and detention without trial of over 112 opposition politicians, trade unionists, and activists. Why did the Minister for Law and Home Affairs torpedo the Select Committee, destroy its credibility, and waste all this public time and money over what I wrote? In this lecture at the University of California, Berkeley, I explain how historians understand Operation Coldstore and the historical evidence surrounding it, how this relates to the mechanisms of and justifications for social control in Singapore, and the hierarchy of priorities that influence decision making for the governing People’s Action Party leaders. The slides and the transcript are available on the New Naratif website [below]. Enjoy! Thank you for inviting me, etc. I’m going to talk today about Singapore’s political economy and some of the forces which shape decision making in the PAP leadership, and I’m going to do that by looking at the Parliamentary Select Committee on Deliberate Online Falsehoods as a case study of the conflicting forces which shape that decision making. So I’ll talk first about what happened and set the context, and then go into how that explains a hierarchy of priorities that influence the leadership. Almost exactly a year ago, I was invited to give testimony to the Parliamentary Select Committee. Naturally I expected that I was going to speak on my submission to the committee. Instead, as many of you know, I was ambushed with a six and a half hour interrogation by the Minister of Law and Home Affairs about my academic work on Operation Coldstore, and more specifically about one paragraph in one academic paper published in 2013. He sought to bully and attack me, behaving rather inappropriately, trying to tear me and my work down, and at one point comparing me to a holocaust denier. When he failed to poke any holes in my academic work, the PAP establishment instead resorted to making ad hominem attacks on me. I was subjected to a length smear campaign in the government-controlled media, with lies published about me online. The Chairman of the Select Committee went further to accuse me of participating in “an international conspiracy to subvert Singapore’s Parliamentary processes.” My company, New Naratif, was denied registration in Singapore – a de facto ban on our operations – and accused of being “contrary to Singapore’s national interests” and a vehicle for foreign interference in Singapore’s politics. The official Report subsequently included a section stating that my testimony was being set aside because I had lied about my academic credentials and my affiliation with the University of Oxford. This was ridiculous, of course. My colleagues at the University came out very robustly to defend me, as did academics around the world, and the government and their Ministers were roundly mocked for their behaviour in the Select Committee and afterwards. Indeed, this whole incident has proved extremely embarrassing to the PAP government. Their behaviour has not put them in a good light. But more than that, it was a massive own goal. A Select Committee has many purposes. The most obvious is that it’s supposed to be educational. Experts testifying about an important issue in front of a committee, and the findings written up into a report that helps the government formulate policy. But another common usage for it, is political theatre. We see this everywhere, including here. Politicians engage in grandstanding and pointscoring. Similarly, a third purpose is to legitimise government policy and legislation. If the government can say that they held a process of public consultation, then they can argue that the subsequent legislation produced from it has been scrutinised by experts and the public alike. The Select Committee on Deliberate Online Falsehoods had all three purposes. In June 2017, Shanmugam had already declared that the government would produce legislation to deal with deliberate online falsehoods. A “no-brainer”, he called it. This was highly controversial, for many reasons. Previous legislation had followed a pattern of vastly expanding the scope of the government’s powers, vastly expanding the definition of what was unlawful, and placing arbitrary decision making in the hands of unelected officials – for example the definition of contempt of court to include any comment on any ongoing court or police case, or an illegal public assembly to mean one person or more, or an illegal procession to include one person or more – such legislation was rapidly introduced and rushed through parliament with minimal consultation. The popular assumption was that, this would be the same. To the surprise of many, the Select Committee was announced. We assumed that it was mostly an exercise to legitimate whatever legislation that the PAP government already planned on passing – wayang-wayang. Yet there was also a chance that the PAP government genuinely didn’t know what it wanted to do, and would draw upon what it learnt in this Select Committee. Some older activists, who had participated in the 1986 Select Committee hearing on the Legal Profession Act Bill, saw it in the context of that SC, which had been an exercise in Lee Kuan Yew bullying and trying to intimidate lawyers trying to uphold rule of law. But younger activists like myself argued that, since the PAP government offers so few opportunities for public consultation, if we did not participate in it, then in the future, the PAP government could argue that there was no point holding public consultations since no one showed up. So New Naratif, my organisation, actually went out and organised democracy classrooms and campaigned for people to make submissions to the Select Committee, regardless of their views. I think we were pretty successful – submissions to the Select Committee were over twice the previous record for submissions to a Select Committee. Perhaps that’s why we were banned. Until the last day, the SC played out as much as we expected. The first week, we had lots of pro-government, pro-legislation witnesses, many of whom were invited to speak, and the government MPs on the committee gave them lots of space to speak and were polite and deferential. Then subsequently you had people who were critical of the government and critical of legislative action, and the members of the committee were contemptuous and cut them off and hit them with straw men and tried to limit them to yes/no answers to false dichotomies. Standard stuff, but even this sort of exchange is still an improvement from the status quo in Singapore. Then we get to me, and the government torpedoed its own legitimisation exercise by totally ignoring the issue at hand, and instead engaging in bullying and attacking, clearly destroyed any pretense at listening and engaging. In other words, over the course of six hours, Minister Shanmugan de-legitimised their entire legitimisation exercise. Why? All that money spent, all that time wasted, to try and fail to take down one academic’s work on an event over fifty years ago, with next to no living participants. Why? So to answer that question, we need to understand the political economy of control in Singapore, we need to understand how the PAP legitimises its rule, and the forces which shape decision making. And to understand why Coldstore is so important to that, we need to explain the controversy over Operation Coldstore. Operation Coldstore was the arrest in February 1963 of over 112 opposition politicians, activists, and trade unionists. It effectively wiped out the political opposition of Singapore, and enabled the PAP election victory in September 1963. The justification for the arrests, then, was that there was an communist conspiracy to subvert Malaysia and would resort to violence to do so. What do historians agree upon? That the arrests were conducted for political reasons, not security reasons. We know that the government did not have evidence that any of the detainees were part of any communist conspiracy to subvert the government. We know this on this because we have the actual case files that the Internal Security Council used to consider and approve the arrests. The vast majority of the detainees are called “communist sympathisers”, “suspected communists”, and “suspected communist sympathisers”. Only a small minority are called “communists”, and there is no evidence presented in any of the cases that they are part of a conspiracy. That seems pretty comprehensive. So where do historians disagree, then? The only major point of contention among historians is actually not on historical fact. The disagreement is, regardless of all this evidence, whether the arrests are still justified or not. So historians who believe that the arrests are justified argue for a “maximal” interpretation of security, where security is dependent on political outcomes which they regard as being necessary for security. Slide 2/3: Page 91 of “Original Sin? 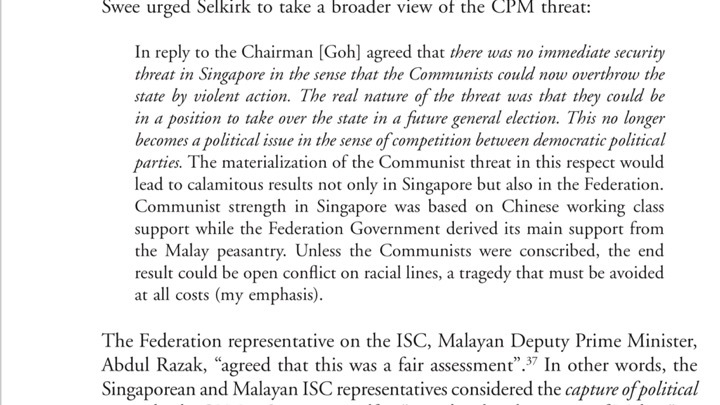 Revising the Revisionist Critique of the 1963 Operation Coldstore in Singapore” by Kumar Ramakrishna (ISEAS, 2015). Elsewhere in this chapter, Prof Kumar accepts the fact that there was no evidence that the detainees of Operation Coldstore were involved in any communist conspiracy to overthrow the government, but dismisses that as irrelevant. His argument thus supports the conclusion political considerations were the primary reason for Operation Coldstore. Kumar instead expands the definition of security so broadly to include political outcomes. It would be like saying, in this country, that the only guarantee against terrorism is to re-elect Donald Trump and the Republican party. You are equating a security outcome with a political outcome. Kumar is arguing that the imminent security threat is that the PAP is about to lose the 1963 elections, and Coldstore was an intervention to prevent that. For further excerpts and discussion of “Original Sin”, please see this Facebook post. It’s pretty much a separate discussion. For the vast majority of historians, we are content to agree that there was no evidence for a conspiracy. Whether or not the PAP was the best party for Singapore is not relevant to the historical discussion. That’s a separate discussion based on your values. So what my work, including my 2013 paper, stated, is that there is no evidence that the detainees of Coldstore were involved in any conspiracy, and thanks to the proof that we have from the British government and the inability of the PAP government to produce any evidence to the contrary, I think we can safely conclude that this is true and it’s pretty much a settled historical issue. So if the PAP government have no evidence, why did they blow up their own legitimisation exercise in order to go after my work and me? Well, first of all I don’t think they actually know that there was no evidence for Coldstore. The official PAP version of history states that Coldstore was a security operation against the communist underground. The current generation of PAP leaders all came of age long after Coldstore, and so have no understanding of the context in which Coldstore was carried out. They haven’t read the documents… well, that’s why you have historians, that’s what we do. But how does this illustrate the broader forces which shape policy making in Singapore and how this Select Committee illustrates this. Political control is exercised by governing Singapore fundamentally as a colony, using colonial-era repression like the ISA and other repressive laws, and by making all forms of political expression and political activity to be illegal. The only politics in Singapore that is permitted is within the arenas that the PAP controls. Social control is exercised through fundamentally socialist mechanisms which justify the intervention of the state deeply into the lives of citizens. The state can heavily influence where you live, who you marry, how many children you have, where they go to school, it can even decide your racial identity for you. We have no right to privacy. Ideological control is exercised by policing speech, encouraging self-censorship, and controlling the definition of a nation, and excluding anyone who opposes the PAP from inclusion in the nation, and thereby allowing them to eliminate their opponents by arguing that the opponents are a deadly threat to the people. Economic control is exercised via the mechanism of the neoliberal developmental state, with the Singapore state playing a massive role in the economy and continuing to run Singapore as a capitalist client state, with the government courting foreign funding to invest and making it compulsory for all Singaporeans to participate in the neoliberal economy by being wage earners and tied into the tax system. The government withholds a huge amount of your income and then distributing it back to you via welfare mechanisms. Military control is very much built into Singapore, with no real distinction between the civilian and military leaderships, and serving military officers heavily embedded into the civil service. Thailand and Burma have nothing compared to the Singapore military’s control via current and reservist officers running Singapore’s ministries and statutory boards. 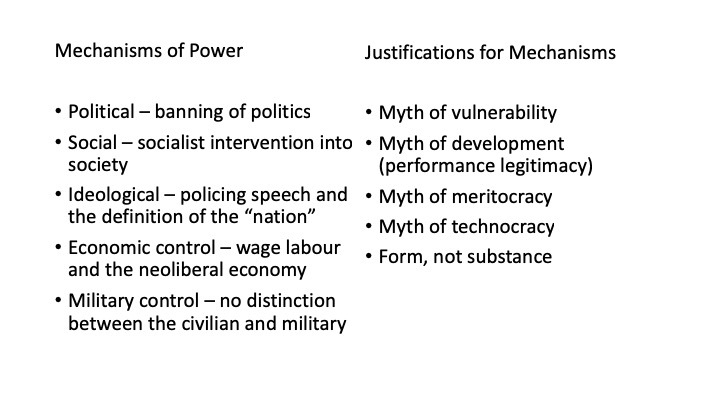 First, since WWII, Singaporean governance has been underpinned by three powerful myths which are deployed in support of its policies: the myths of vulnerability, meritocracy, and development. In brief, the myth of development defines government performance legitimacy in terms of economic performance, such as by using narrow economic criteria, such as Gross Domestic Product (GDP). The myth of meritocracy argues that anyone can rise to leadership in Singapore based on their ability, regardless of their lineage, social connections, race, or religion. The myth of vulnerability argues that Singapore’s survival is never assured, since the country is small, susceptible to external threats and currents, and composed of a volatile mix of ethnicities and religions. RELATED ARTICLE: JUSTIFYING COLONIAL RULE IN POST-COLONIAL SINGAPORE. THE PAP USES THE SAME THREE MYTHS AS THE BRITISH COLONIAL GOVERNMENT—OF VULNERABILITY, MERITOCRACY, AND DEVELOPMENT—TO JUSTIFY THEIR POLICIES. Rhetorical reclassification: The PAP has learnt to cloak this by passing this through the form, not the substance of liberal democracy; by adopting international rhetoric but changing the actual substance. Hence pretending to consult, or having elections but rigging them to maximise outcomes for the PAP. Critical to this is the idea of technocratic governance, where political decisions are passed to an ostensibly disinterested specialist body of “experts” to make decisions. New laws increasingly place the power for these arbitrary decisions in the hands of unelected officials, like the AG, who is the PM’s former personal lawyer. So what are actually political decisions, the outcome of political horsetrading and a clash of interests, is instead presented as a technical decision, and in this way accountability for political decisions is shifted from elected leaders to unelected, appointed officials, who are key allies of the Prime Minister. Justified via placing decisions in the hands of a technocratic committee or person, eg AG – who arose to their positions on merit, not a pre-existing relationship with the PM or his family. Justified via myth of vulnerability – Green Paper repeatedly emphasised Singapore’s vulnerability to fake news. The fact that the fake news law has taken so long to produce, especially when Malaysia took only a few months to come up with their version, shows how the credibility of the law has been damaged by the events of the Select Committee. But it will come. They are just waiting for the scandal to die down a bit. But what is more important than the law are these mechanisms and myths, and that’s why they had to act to protect them. For example, central to the myth of vulnerability, of course, is that Singapore was under threat from communist subversion. During the Malayan Emergency, this interpretation of threats provided the justification for martial law, which entailed the suspension of the rule of law, habeas corpus, and due process. They empowered the government to detain without trial, ban publications, disperse any meeting, impose curfews, arrest anybody without a warrant, etc. etc. The important point is this: Despite the intent of the British that these restrictions would be temporary, many of these regulations were subsequently codified into different statutes and continue to exist in Singapore today in different statutes such as the Sedition Act, the Internal Security Act, and the Criminal Law (Temporary Provisions) Act. These colonial era laws which were designed, rightly or wrongly, to address armed conflict, are still deployed today to control the population. Special Branch documents show that the MCP never actually had a significant foothold (as opposed to the rest of Malaya). Nor did the communists have any real control of their leftist allies, who were driven by a wide variety of interests and largely autonomous of the party.Hounded by the Special Branch, the Singapore MCP was decimated and reduced to irrelevance by 1950.The MCP was irrelevant to the lives of the majority of Singaporeans, except as a bogeyman trotted out by colonial officials who wanted to instil fear in the population. 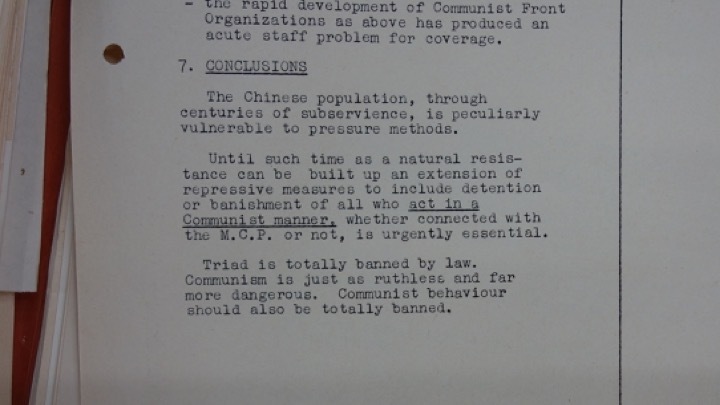 Until such time as a natural resistance can be built up an extension of repressive measures to include detention or banishment of all who act in a Communist manner, whether connected with the MCP or not, is urgently essential. Triad is totally banned by law [sic]. Communist is just as ruthless and far more dangerous [sic]. Communist behaviour should also be totally banned. banned. Thus armed with this document that redefined subversion as merely acting like a communist, whatever that means, the Council of Ministers proceeded to lock up and banish opposition politicians, and dissolve organisations in 1956/7. “The Menace of Communism in Singapore”, Annex to CM Paper (56/II)235, 10 August 1956, FCO 141/14772, National Archives of UK. If we go back to the press statement after Coldstore in 1963, this sentence in particular: “to sabotage the formation of Malaysia” is a complete and utter lie. Every single party in Singapore was for the formation of Malaysia. The right-wing LSP; UMNO, LF, PAP, BS; it weas the declared policy of the Malayan Communist Party since 1946, when Malaya was first partitioned, to achieve reunification. They were the leaders in the AMCJA-Putera coalition protesting Singapore’s exclusion from the Malayan Union. Most importantly, they knew that the only way they would survive was by achieving Malaysia and having the British leave, because it was the British military who were the main guarantors of the BN and PAP governments. The MCP knew it couldn’t defeat the British military, so they want Malaysia – and now they are trying to subvert Malaysia? Makes no sense. So you see, Coldstore cuts through all of these by striking at the heart of these myths and mechanisms. If Coldstore is based on a lie, then it calls into question the myth of vulnerability. It calls into question the continued existence and use of detention without trial, the continued existence of the ISA [colonial mechanisms]. It undermines the PAP claim to monopolise the meaning the definition of the nation, by starkly illustrating how this definition was manipulated for political gain [intellectual control]. It undermines the PAP notion of technocratic governance, by demonstrating how Special Branch was ordered to create cases for the detention of opposition politicians without evidence. But lastly, and most of all, however, the PAP cannot get rid of Coldstore because of its centrality to the Lee Kuan Yew [LKY] myth. The current PAP government have no achievements to speak of. They are entirely reliant upon LKY and his legacy to legitimate their continued authoritarian governance. Coldstore undermines a crucial part of the Lee myth as constructed. Undermining Lee undermines the whole legitimacy of PAP rule, and so they find it impossible to break from it in any significant way. The problem of course is that Lee left power in 1990 and died in 2015, and the world has drastically changed. Lee was spectacularly successful for his time, but he was a product of hot and Cold War. Today our challenges are different. Because of this, the PAP government is trapped in the past. I think Mr Shanmugam would have been better off ignoring my work on Coldstore and focusing on the Select Committee as it was meant to be – a legitimisation exercise, rather than try to preserve the legacy of a dead man who is irrelevant to our world today. Supplement 4 to Singapore Police Intelligence Journal 1954, August 1954, FCO 141/15951; Supplement to Police Intelligence Journal 5/55, May 1955, FCO 141/15951; Singapore Intelligence Committee Report, 27 July to 9 August 1956, FCO 141/7373; “Communist Front Organisations”, March 1956, FCO 141/14772. 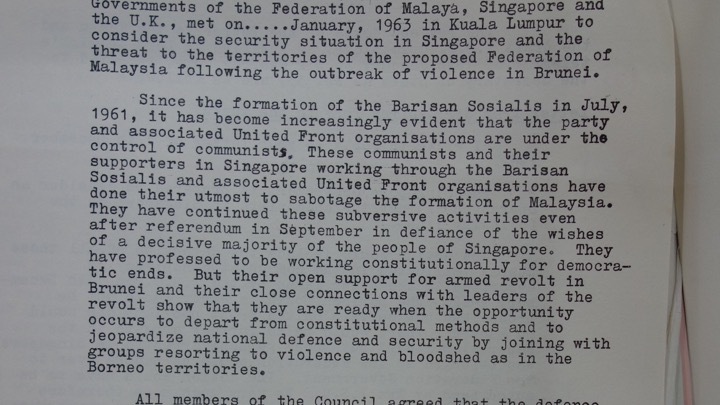 “The Menace of Communism in Singapore”, Annex to CM Paper (56/II)235, 10 August 1956, FCO 141/14772.